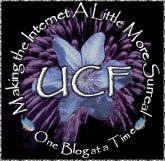 Polybloggimous: Another Saturday Multi-Post. Admit It. You Missed These, Didn't You? Another Saturday Multi-Post. Admit It. You Missed These, Didn't You? So the cats did their normal thing and woke me up around 6:30 this morning. Stupid felis domesticuses. (That probably isn't the right way to pluralize that but I don't know any Latin even after I'm properly caffeinated.) Anyway, the local CBS Morning Show (whatever they call it), had this guy on. And they kept announcing, "We'll be back with Paul Potts right after this message. ", and I kept thinking they were going to have Pol Pot on the damned show. And I thought that was going to be one hell of a get, what with Pol Pot's rather negative opinion of all of us American Running dogs, and what with him being severely dead and all. I was really disappointed when they put the singing guy on. If I were him, I'd have changed my name just to avoid any negative connotations. 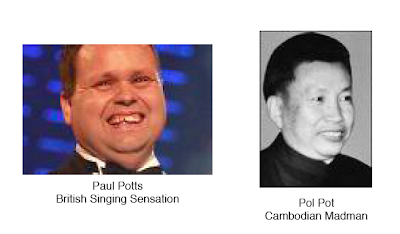 Something like "Paul Potts, the guy who sings and hasn't killed anybody at all", would work for me. And if he doesn't want to change his name, he could at least foam at the mouth a little just for ambiguity's sake. I'll be back later with something else. I don't know what it will be and I can't promise it'll be worth your time or mine...but it'll be something. Hey! It's Multi-Post Saturday. Yay! The Worst Shopping List In The History Of Shopping Lists. Anyway, last night was taco night. At first glance, the list appeared to just have every ingredient needed for tacos without any regard to what we might actually have in the house already. A quick perusal of the cabinet and the fridge allowed a number of ingredients to be crossed off the list. A second perusal of the list revealed that there were other ingredients that were on neither the list nor on our shelves. 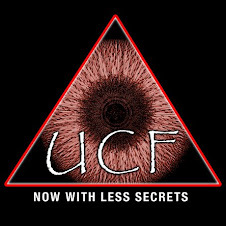 *See yesterday's post if this makes no sense to you. and GF says, "You just make this stuff up as you go along, don't you." Don't give him such a hard time, Nathan. For all you know, he had his name legally changed from "Stalin Hitler." This cracked me the hell up. "Severely dead." hehe.